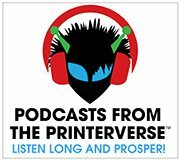 Greetings Earthlings, Prink Geeks and Citizens of the Printerverse! It’s a new year and while I am sure you have been planning for it, it’s always nice to hear some print prognostications from a wide range of industry pros. You can use this info to validate your direction or adjust it, seek out events to help you understand these topical subjects better, and even find help to implement them into your business. Personally I am using this post as a guide to creating conversations with you, bringing these topics to life through our weekly #PrintChat, and partnering up with experts to provide free educational opportunities. While I would never refer to myself as an industry expert, this is my site and one of the perks of ownership is that I can add my thoughts here – so I am going to! My 2015 CMYK Manifesto is coming out in January’s News From The Printerverse, so make sure you are subscribed! After mine, the comments below are posted in the order I received them. Happy New Year and Print Long and Prosper in 2015! Print and Paper are going to be directly in the line of fire as far as “the environment” even more in 2015. Consumers find going “paperless” a quick and easy way to feel environmentally responsible, and brands will need to show they care by providing even more paperless engagement and options in their marketing and packaging. It is up to us to help customers print smarter so resources aren’t wasted, and help educate customers and consumers that using paper and printing responsibly won’t leave the earth barren of trees and depleted of oxygen. Supporting Two Sides (select the country that applies to you) is a fantastic way to make sure we set the record straight, and help end corporate greenwashing. Visit the site and consider joining as a member for as little as $250 for the year. “Click. Share. Bust Some Myths” as often as you can through your channels… we are all in this together! 2015 will be another year of both consolidation and transformation for the printing and publishing industries. As the global consumer base increasingly turns to mobile communications for securing and communicating information and entertainment, there will be an increasing array of opportunities for both print service providers and publishers to find innovative ways to monetize new, mobile-oriented services. Despite the many years of consolidation these industries have undergone, 2015 is already shaping up to be a busy year in terms of events, both for customers and analysts/journalists. This is a sign that despite, or perhaps because of, the many disruptive forces we have been dealing with, the supplier community sees opportunity and is investing in these events to keep the momentum going. All in all, 2015 should be an exciting year – and a vibrant run-up to drupa 2016, where we can hope to see even more innovation surface. Remember when the market shifted from dumb phones to smart phones? CRTs to LCDs? Dial-up to broadband? DVDs to flash drives? In 2015, we will start to see the beginnings of a seismic shift in print from offset to inkjet. Quality, media versatility, and application expansion will give more print providers, brands, agencies, and publishers the ‘aha’ moment, inspiring them to shift more work to high-quality production inkjet for improved impact and ROI. Postal rates next will be more unpredictable than they have been in a long time. This article explains it pretty well: http://deadtreeedition.blogspot.com/2014/09/postal-rates-in-2015-could-rise-or-fall.html. With the updated information in this article, we could have a rate increase in April and then a larger rate decrease in the summer when the “temporary” surcharge goes away. But you know how things go with the government: “Temporary” taxes have a way of becoming permanent ones — in this case either from a court order or because Congress decides that mailers should pay for its bad decisions. And another: Sales of printed books will do well next year, perhaps increasing. But traditional offset book printers will suffer, as more book printing shifts to digital presses, especially for print on demand. Personalisation, across all channels, will be of increasing importance in 2015. Mass marketing used to be tolerated – just one of those things you had to bear. Now it damages brands. Period. We receive so many messages in our day that those untargeted messages have moved from being acceptable to unnecessary, to damn right annoying. Engagement is the buzzword for 2015 – genuine one-to-one communication. 2015 will be the year in which marketers will change their efforts to converting opportunities one by one – not by throwing enough at the wall and hoping it sticks. With the exception of a very few, developing business is not about numbers, but about seeking genuine engagement with a few. Meeting hundreds of people as I do in my world of LinkedIn training for business to business solutions I ask a simple question. “How many new clients would it take to make you very successful next year?” One a week? One a month? The numbers are rarely beyond two figures. Why then do we mass market our effort to so many people hoping a moment of magic will occur? For that’s what it would take for a random connection to do business with you. No – you are far more likely to do business with someone with whom you have created a genuine relationship through Know, Like, Trust. 2015 is the year before drupa so a lot of things will slow down to get ready for big announcements there. But, that doesn’t mean nothing cool will happen. New solutions with higher resolution across a variety of platforms, printers adopting new media to print on, and great new finishing solutions will come to the floor to change the market perception of what printing using digital technologies really means. The first big WOWs should start in January and keep on coming! More value add. Paper and print as the message/the experience rather than just a medium to deliver printed words on. Less transactional work and more wow factor on shorter runs. More trade printing. More digital. Print has really expanded now into many new areas – so lots more paper diversification to continue next year. Clients want more choice and are always chasing new stocks and machine technology is dictating this. New machines/ new paper sizes/new substrates. Lastly, tactile stocks have been making a comeback for a few years and I think this will continue. People want their print to stand out. Smaller print runs with a powerful/interesting feel and look. Think Buffalo/SKIN/Matter/Knight Vellum – touch/feel/excite/spec/boom town!! With all of the privacy issues and technology breaches we’re seeing in the digital space – and the ease and frequency in which they seem to be happening, I think we’re going to see a rediscovery of mail. Privacy is one of its greatest benefits, so my prediction is that there will be renewed interest in mail as a private and targeted marketing and communications medium. When we look forward to 2015, there are a number of trends that point to continued solid growth opportunities in the UV Sign & Display market. Overall, customers are focusing on productivity, efficient end-to-end integration and ROI. Print service providers (PSPs) will continue to buy more productive equipment and see the value of automation (automated board feeders/ABF, etc). Workflow is gaining importance. PSPs are becoming fully integrated with workflow solutions that improve file delivery, offer consistent color management and link them to their upstream clients via web-to-print. Successful PSPs know the ultimate goal is to increase customer satisfaction, gain efficiencies and save time. Customers are looking to expand their application scope and broaden their market reach into the world of industrial inkjet. Digital inkjet manufacturing is becoming feasible on existing inkjet printing platforms. Examples include printing doors, cabinet fronts, touch sensors or personalized sporting equipment. In the mid-segment and high-end market, businesses will continue to expand by offering printing capability with finishing, tooling, mounting and multi-media utilizing various inkjet technologies to remain relevant and grow. 2015 will be the breakout year for conversion of a lot of print that doesn’t need to happen on high end offset presses to great, equivalent digital presses. It’s a new generation of print buyers and print specifiers, and they are finally getting on board the digital train. From packaging to posters, direct mail marketing to in store signage, digital gives you the flexibility, color reliability, and innovative substrate alternatives. I can’t wait! I think disruptive print communications will continue to grow in popularity and evolve in the coming year. Innovations such as 3D printing and augmented reality are taking print to another level, challenging the boundaries of traditional print while adding value to it. These innovations are also making it possible to engage audiences in more dynamic ways and across a variety of media to make messages more memorable. Point-of-sale and point-of-purchase graphics have been strong in the recent past, and I anticipate that this will not change in 2015. These tried and true applications will continue to thrive, and I also believe packaging will continue in popularity. 2014 saw the explosion of web-2-print , vendors seemed to pop up almost monthly, with everything from simple shopfront ordering systems, branded for print, all the way up to massively complicated and highly integrated web stores where clients could design, approve, order and pay for their print. What I am most excited about for 2015 though is the evolution of the Print MIS as a tool for smaller businesses, and what the fierce competition means for the printing industry as a whole. Lots of software vendors means there is a good strong market for software products in printing ; what a good indicator of an industry that is not dying! Many people have taken steps to move online (or into the cloud if you want to use the latest buzzwords), either by shifting their hardware infrastructure offsite into managed servers, or simply by using tools such as managed email accounts, online CRM packages, or online accounting. Once we make that mental shift, it becomes easier to grasp the value of an integrated MIS that is not only offsite, but managed and hosted for you. Many people keep predicting massive growth in the “cloud”, I believe we may have finally reached a mass acceptance and I predict a tipping point in 2015. I think that by December 2015 more printing companies will have moved ” into the cloud” than not. Smaller companies will choose managed solutions including online software, larger companies will want more finely grained technical control and will choose offsite managed servers that are accessed remotely, but still “in the cloud” none the less. I also predict a much bigger International Print Day celebration, we will trend in Australia, and possibly even the planet this year. Viva #IPD15! Where do you think Print is heading in 2015? Any of these predictions resonate with you? There is such a wealth of information in this blog post that you could read it a few times and still find something new and interesting to unpack. A must-share for the beginning of 2015!